In the past Jens has performed several times at the prestigious North Sea Jazz Festival, among others also with Slide Hampton and Jim McNeely. In 2003 he performed with Michael Brecker in the Hague, a concert that was later released on DVD. 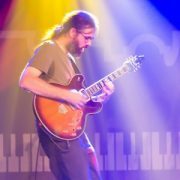 He has appeared on numerous albums the last 10 years and has been working both as composer/arranger and guitarist. In 2013 Træben was on tour in Canada, besides playing in Scandinavia and Benelux. 2014 will see the 3rd album from Træben, a concerts in Berlin and at Copenhagen Jazz. In Februray a short tour in Spain with colleague Marcos Pin resulted in an album that will be released in late 2014.